I landed at Fort Lauderdale* on Thursday late morning and quickly drove down to South Beach to kill a few hours and get some writing done between ball games. The culture down Ocean Drive gets pretty wild at night: the clubs are bumpin’ fishbowl sized drinks are flowin’, cars with neon undercarriages blast Drake and Lil Wayne as they’re cruisin’, there’s even one dude who rides around on a bike with a lemur on his shoulder…it’s weird, man. But in the mid-afternoon things are quiet and relaxed. After a few hours of reading and writing my Tropicana Field post, I headed back over the bridge over the intercostal water way back toward downtown. * – The last time I was at this airport, I was watching the Chiefs point the Colts in the first round of the NFL playoffs. I paid for in-flight WiFi so I could celebrate with the rest of the KC-bound fans…sigh. Depressing memories to be had here. Miami is beautiful. The water and the palm trees and the people and the buildings – it’s all so attractive. The architecture is modern with crisp lines and bright pinks and greens and blues lighting up the facades. 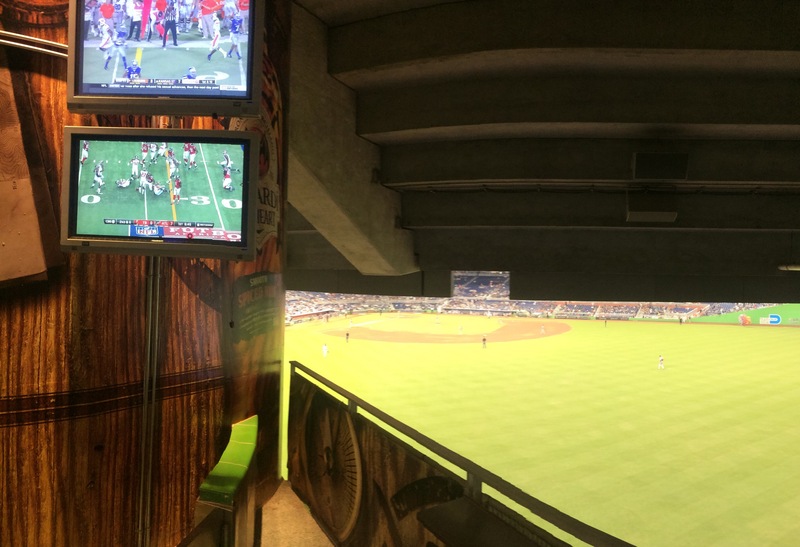 It’s a different world in Miami – the ballpark especially. 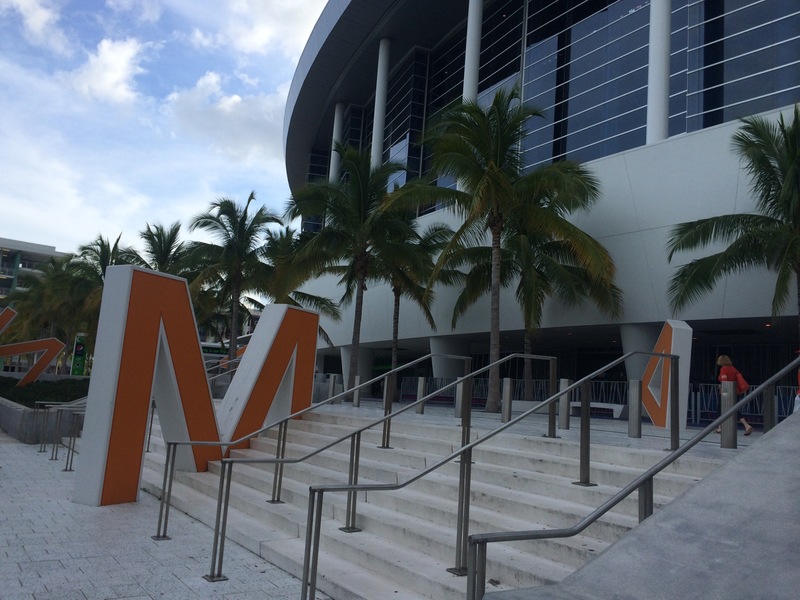 From the exterior, Marlins Park looks like a mashup of Cowboys Stadium and the Starship Enterprise. The domed structure is very futuristic looking: it’s the first ballpark that is considered a “contemporary” design, and the first since 1992 not to embrace the “retro” ballpark look. In fact, it’s hard to even call it a ballpark; it contrasts so sharply with the rest of the league. It compliments the rest of the flashy Miami skyline nicely…or at least it would, if it wasn’t in a totally different neighborhood. The ballpark (again, if you can call it that) is situated in the heart of the Little Havana neighborhood a couple miles west of downtown. It’s a stark juxtaposition – such a colossal modern structure surrounded on all sides by single family homes and duplexes all housing Latino families. As I pulled up to the ballpark, I was flagged down by a small woman waving her arms and hollering at me in Spanish. At first I was concerned, but then realized she was just trying to get me to park in her driveway literally right across the street from the ballpark. She was charging ten dollars. Felt pretty reasonable considering how much it costs to park at other stadiums, let alone in other areas of the same city. I probably got ripped off, but she was so sweet, I don’t really even care. The letters are strange. They’re huge 10 foot letters that are half submerged beneath the concrete and they don’t appear to have any real system about them. What do they spell? I stood there for like 5 minutes trying to rearrange them and finally gave up and looked it up. They’re a tribute to the “MIAMI ORANGE BOWL” that used to utilize this same plot. Interesting idea. Kinda lame actually. The giant track beams, however, are NOT lame. They’re amazing actually. 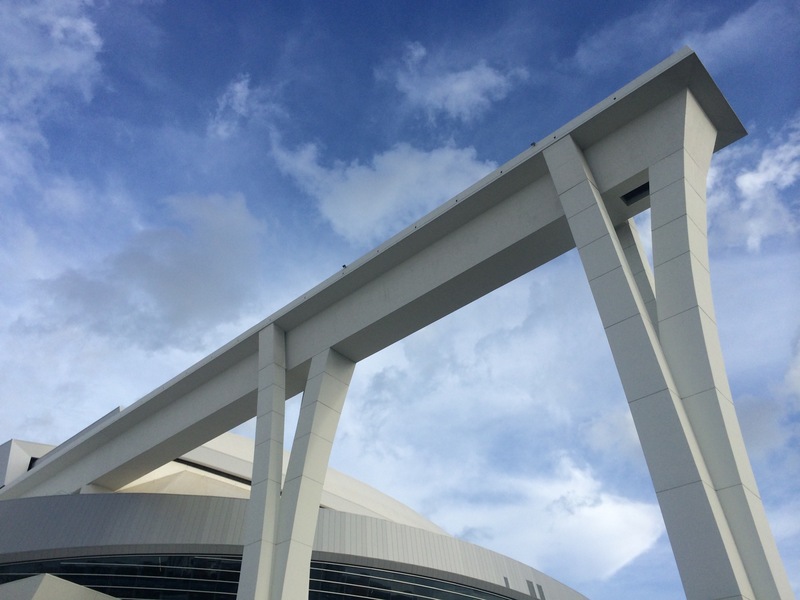 These huge concrete structures hold up the retractable roof! The roof opens up at the middle and the giant portion slides back away from the park and on to these tracks. Very impressive design – it moves the whole roof in 13 minutes. To this day, there have been zero rainouts in Miami, and I doubt there will be any soon. I wish I would’ve gotten to see it opened up. Indoor ballparks just feel stale and cold to me, and this one was no different. Even the bright green outfield wall couldn’t liven it up for me. Although – that could’ve been because the place was almost completely void of fans. Can’t blame them. Their number one reason to come to the ballpark, Giancarlo Stanton, got hit in the face with a fastball in Milwaukee last week and is done for the season. 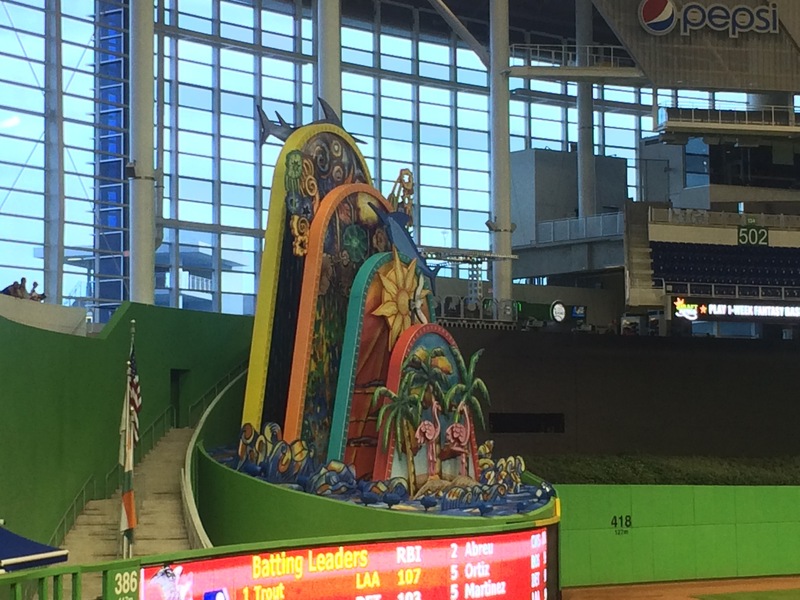 The other feature inside is the “artwork” out in centerfield. It’s gaudy and tacky looking in my opinion. Looks like a rainbow Happy Meal toy or a hodgepodge of lawn ornaments. Supposedly it goes crazy whenever the Fish hit a home run, but that didn’t happen while I was there. I guess I can’t complain – I’ve had pretty good fortune with centerfield home run gimmicks this year – the big apple at Citi Field and the Minnie & Paul logo at Target field, for example. The Marlins franchise has only been around since 1993, but they’ve somehow already managed to win two World Series championships: 1997 and 2003. In those days, their “ballpark” was a repurposed Dolphin Stadium and held something like 80,000 fans. They were bold in their new design to say the least. It was the right move considering the culture in Miami, but it’s a startling contrast to the other 25 ballparks I’ve been to this year. 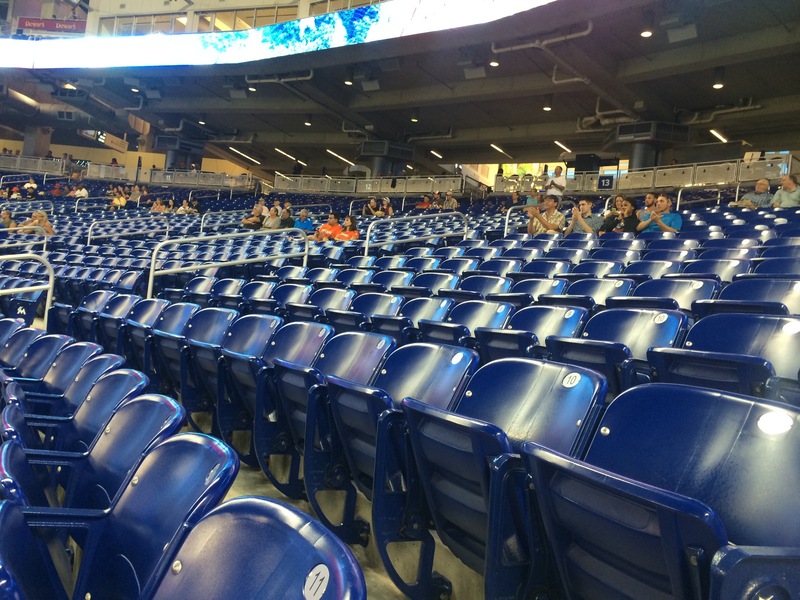 The only spot that is remotely similar to Marlins Park is Chase Field in Arizona. Massive retractable dome and a cavernous climate-controlled indoor space. Oh! I almost forgot to mention the “cheerleaders”. Many ballparks don’t have a pep squad at all, and the ones that do really only employ them so they can assist the mascot in throwing out t-shirts and launching hot dogs. They wear shorts and matching shirts/jerseys to signify their small role. Unlike the other major sports, cheerleaders/yell leaders don’t really exist in baseball. But not in Miami. The cheering group at Marlins Park utilizes choreographed dance routines on top of the dugout and up and down the lower level aisles. The guys wear Spanish-style flamenco/matador costumes and the women match them with more of a baseball take on a cheerleader outfit. Super weird. Didn’t even feel like a baseball game at times and made the ballpark feel more like an arena. I kept being reminded of the phrase, “it’s not wrong, just different.” That’s the mantra I always quote when I am presented with cultures different than my own. Miami feels like a different country at times. In fact, it’s not uncommon to hear 4 or 5 different languages being spoken on one short walk along South Beach – Spanish, French, Chinese, Korean – it’s an eclectic mix of cultures colliding, and for a white English speaking Midwesterner like me, it can feel like a very different place. With all the Latin American influence in the game these days, baseball ought to thrive in South Florida. It has a unique opportunity to reach a population unlike most other cities in America. When they moved to their new ballpark in 2012, they had just hired long-time White Sox manager, Ozzie Guillen, to be their skipper. The move was intentional. Bringing in a Latin manager on a team with lots of Latin ballplayer in a Cuban neighborhood in an already diverse city was the Marlins way of connecting with the public. Unfortunately, Ozzie Guillen screwed it all up by making some controversial comments about Fidel Castro and he was quickly canned after a season. Then in 2013 the team was one of the worst in the league. But this 2014 team has been much improved. I wonder how things would’ve panned out if Jose Fernandez hadn’t needed Tommy John surgery. Maybe more importantly, the Marlins have two players in Fernandez and Stanton that can serve as heroes for young Latin American kids in the area. Giancarlo was having an MVP season before getting hit, and Jose Fernandez won the 2013 Rookie of the Year, barely beating out Cuban star, Yasiel Puig. This year, Jose Abreu adds to the list of Cuban born heroes in the MLB. The increase in Cuban immigrants has changed the baseball landscape in really positive ways. In Miami, these players are connecting the team with the culture of the city, which is why professional sports exist in the first place, right? It’s for the fans to enjoy. It’s not the normal ballpark culture, but it’s the right ballpark culture for it’s city. It’s not wrong, it’s just different. In terms of spirituality, I love that each of us connects with God/the Deity/the Universe in our own way. Baseball speaks to me, but something else probably speaks to you. Maybe it’s nature, family, community, reading, praying, sleeping, running or participating in a certain passion. And every single one of those is valid – there is not a wrong way to connect with God – just different. The Washington Nationals were in town fresh off clenching the NL East division. Gio Gonzalez pitching for the Nats against Brad Hand for the Fish. The Marlins scored first on back to back doubles from John Baker and Reed Johnson in the 2nd. Hand was perfect through 13 batters before Anthony Rendon singled in the 4th. Next batter, Jayson Werth, struck out, and Hand threw over to first and had Rendon picked off but they botched the run down and Rendon advanced. The error opened the flood gates: double, single, single, single, single. It seemed like every ball put in play somehow found green. By the time Gio Gonzalez popped out to end the inning it was 5-1, Washington. Both teams added another run later, but that was basically it. Game ended 6-2. Hand got the loss but pitched way better than his line score indicated. Gio Gonzalez was great too – 7 innings, 6 hits, 2 runs. When the game seemed thoroughly out of reach, I left my seat and explored a little bit. I found a bar out in centerfield showing the K-State/Auburn game and the Thursday Night Football matchup on TVs with a view of the field behind me. Only buzzkill: the Wildcats lost and that the TNF game was a blowout. Twenty-six down. Four to go.